Allergies are common, usually resulting in skin signs, although some cases also show gastrointestinal (stomach and intestinal) symptoms. Allergies affect dogs and cats, but research is more limited in cats, and we tend to extrapolate our knowledge of dogs to our cats. Most allergic disease is lifelong, and is managed rather than cured. Although not life-threatening, allergies can have a major impact on the quality of life of our pets, and can be extremely frustrating, time consuming and costly over a lifetime. There is no specific test for allergic skin disease. Diagnosis is made by ruling out other skin conditions that can mimic allergies. Whatever pets are allergic to, they often show similar signs. Once an allergy is diagnosed, the cause can be looked at in more detail. 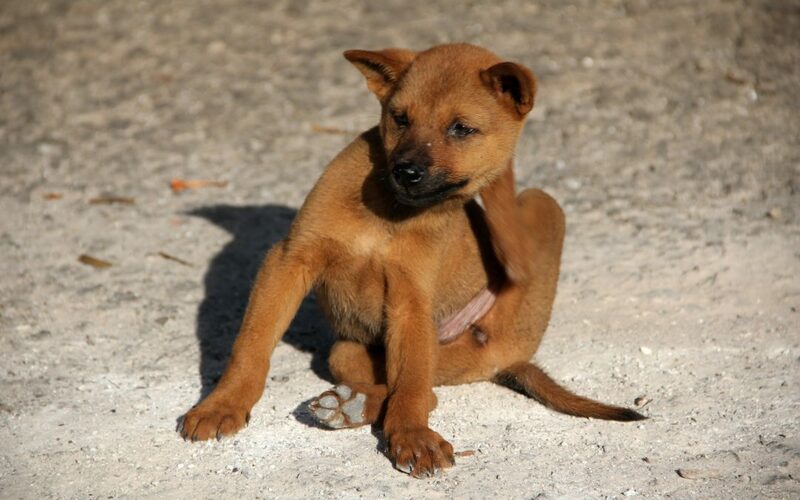 Flea allergic dermatitis (FAD) is common. The saliva from a flea bite is the trigger, not the flea itself, so large numbers are not needed for a reaction. Sometimes the culprit is long gone before symptoms arrive. Atopic dermatitis occurs if dogs produce antibodies to something in the environment (an allergen) such as house dust mites or pollen. It’s thought to be almost 50% heritable, with certain breeds such as West Highland White Terriers and Labradors more at risk. The environment the pet grows up in, defects in the skin’s natural barriers and exposure to parasites also contribute. It’s thought to affect 10-15% of our dog population, while figures for cats are uncertain. Food allergies are due to an abnormal immune response to an allergen in food, normally a protein, leading to the production of antibodies towards it. Primarily, these are skin signs although up to a third of cases in dogs will also have gut signs. Hypoallergenic diets which contain a protein and carbohydrate never before encountered by your pet (sometimes called a ‘novel’ protein). It may be difficult to be certain you are choosing a novel source that your pet hasn’t met previously. Hydrolysed diets have had the protein and carbohydrates broken down into very small particles considered too small to trigger an allergic reaction. Theoretically, a dog with a chicken allergy could be fed a hydrolysed chicken diet and improve! No treats, flavored toys, medications, or toothpaste are allowed during the trial. It must be strict or it will fail. If symptoms fade, confirmation is made by deterioration once the original food is reintroduced. These diets are useful for diagnosing food allergies, but can be fed long-term if finances allow. Otherwise, the next challenge is finding what foods they can have. Failure to respond to a diet trial leaves us with atopic dermatitis. How can we manage atopy? Blood or skin samples identify the specific allergens involved. These allergens are then administered via vaccine in very small amounts, increasing at each treatment to a maximum dose, thus de-sensitising the dog. These tests are unreliable in cats. The vaccines provide at least 50% reduction in signs in 60-70% of animals. It can take several months for effects and require no medications for a few weeks prior, which may be an issue with severe signs. You can try reducing exposure to the allergen but it’s rarely successful alone. Reduce house dust mites by vacuuming regularly, and washing bedding and toys at high temperatures. For grass allergies, keep grass short and wash the dog after exposure. For pollen allergies, monitor pollen counts and time walks appropriately. For any allergic pet, minimise exposure to fleas by using regular, effective, preventative flea treatments as multiple allergies are common. There’s a baffling array of shampoos on the market. Some are soothing, or anti-itch, others help prevent or treat secondary yeast/bacterial infections, and most remove allergens from the skin’s surface. Regular use of ear cleaners can help reduce the frequency of ear problems. Our vets can help you choose a shampoo and/or ear cleaner. Studies have shown a combination of omega-3 and omega-6 fatty acids may help improve the structure and function of the skin. They are unlikely to be effective on their own but useful as part of a management plan. Several ‘anti-itch’ medications are available for treatment and management. Our vets can discuss the pros and cons of each. All pets react differently so trials may be needed. Glucocorticoids (steroids) are relatively cheap and effective in the majority of cats and dogs. There’s a high risk of unwanted side effects with chronic use and, as this disease is lifelong, they must be used cautiously and at the lowest effective dose. Cyclosporine tablets give similar relief to steroids in cats and dogs, with lower risks of side effects but are costly and slow to work. Oclacitinib tablets seem relatively safe and effective in dogs, while working quite quickly, providing a mid-cost option. Lokivetmab is a recent addition to the arsenal of treatments for dogs. It’s a monthly injection, so helpful if tablets are an issue. It’s relatively safe but its effect can be variable. When effective it reduces itching by 60%. Creams and sprays are available to apply locally but often signs are not local, and preventing pets licking medication off can be challenging. Antihistamines don’t have a good evidence-base but are low risk so may be used. Allergies can be mild, but if severe, can affect your pet’s quality of life and be upsetting to watch. As there’s no cure, and no single treatment, understanding the condition and preventing flare ups is vital, and acting swiftly when they do can reduce discomfort and prevent long-term damage.